Admit it. If you could just have things your way, you’d rather spend Monday relaxing than reporting for work. Trust me, I know how that feels. Now, before you feel bad about wanting to give yourself a break from your hectic work schedule, let me tell you that you’re not the only millennial who feels that way. Just think about that! Wouldn’t it be nice to retire long before you reach retirement age? Yes, wouldn’t it be wonderful to enjoy retirement even before you turn 40? Granted, Livingston’s circumstances may be different from yours in many ways. But, and here’s the thing, the formula she used toward achieving financial independence and retiring early (a process known as FIRE) is something that you definitely can benefit from, regardless of your present income level. Excited to learn how? Here’s what you could do on your journey toward FIRE. The first step towards financial independence is, of course, boosting your income. Most of those who plan to retire early think that the easiest way to go about things is just moving to a place where the cost of living is relatively low. While cutting back on expenses is definitely one way to achieve financial freedom, relocating may not always be the wisest course of action. Before making the final decision, consider the job opportunities available to you in the area you plan to relocate to. Often, the benefit of living in places where living costs are relatively high is having the best job opportunities within your reach. So instead of opting to relocate, why not assess your present job? Look for ways to boost your income to the maximum level and speed up your progress toward financial independence. Once you’ve already done what you could to boost your income level, it’s time that you start saving up. Don’t fall into the trap of spending as much as you can earn. Sure, it’s not bad to treat yourself to something nice once in a while as a reward for your hard work, but it would be wise to make sure that your savings—not your expenses—take a larger chunk off your budget. Livingston mentioned earlier, did just that. She revved up her saving rate sky-high, pushing her budget to the limits so that she saved up 70 percent of what she earned. While you do not have to have the same saving rate for yourself, you definitely could see to it that you save more than you spend. Now let’s say you already have enough saved up in your bank account—enough to last you for several years without you having to work. What next? Well, if the only thing you do with the amount you save up is spend, sooner or later your funds will dry up. And then you’ll be back right where you started—in the need for regular employment. So what you need to do is make sure that you do not run out of funds. Remember, financial independence and early retirement do not equate to not working altogether. It simply means having the luxury of time—time to earn at your own pace and to pursue other life goals. What, then, can you do to make your money grow? Invest. If you are no expert in handling investments, have someone professional to help you out. Investing in the right businesses and financial securities will ensure that you do not run out of finances despite your decision to quit the workplace. Yes, by boosting your income, saving more than you spend, and growing your money, you can achieve what others only get to enjoy when they’re already 40 years old or older. Really, why settle for traditional retirement when you could speed up the process and get more time to enjoy your hard-earned financial rewards? And believe me, if Livingston made it, so can you! Start early on your goal toward FIRE. Start today. 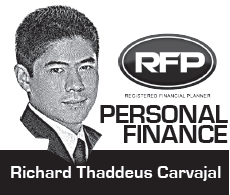 Richard Thaddeus Carvajal is registered financial planner of RFP Philippines. He is also CEO and president of Philgems Realty Corp. To learn more about personal-financial planning, attend the 64th RFP program this September 2017. To inquire, e-mail info@rfp.ph or text <name><e-mail> <RFP> at 0917-9689774.